Car Audio & Video. 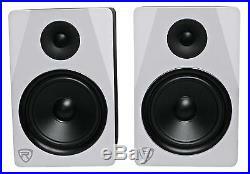 Package: Pair of Rockville APM8W 8 2-Way 500 Watt Active Pair of USB Studio Monitor Speakers in White. Condition: BRAND NEW IN ORIGINAL PACKAGING. 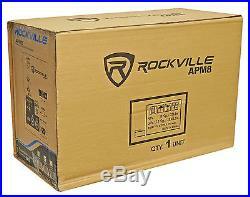 (1) Pair of Rockville APM8W 8 500W Active/Powered USB Studio Monitor Speakers. The Rockville APM8 Active Studio Monitor Comes in Pairs and each monitor is bi-amped. What this means is that there is a separate amp for the highs and a separate amp for the lows! Each speaker has 250 watts peak output power and 125 watts RMS giving you a total of 500 watts peak and 250 watts RMS per pair. We spent a lot of time developing the most premium studio monitors we ever built! If you are an audiophile you will find what we did to be quite amazing. We are one of the leading speaker manufacturers in the USA, and we have a state of the art manufacturing process. There is a lot to talk about so I will break it down into sections. Description of the enclosure. We chose a wooden enclosure as opposed to a plastic enclosure. Your studio is made of wood for a reason. The sound characteristics of high quality wood are better than plastic. We only use the highest quality MDF wood. We do not bother with cheap particle board material when we want to make the best speakers. The thickness is 0.5″ around and the front board is a full 1″ thick to give you the best sound quality possible. The enclosure is built with the perfect amount of air space to maximize sound quality for a studio. Every studio or computer room should look beautiful. We believe speakers should enhance the look of a room. We make these speakers in 3 beautiful finishes. Painted black, painted white, and wood finish. We use “baking paint” made for wood surfaces. It is long lasting and the best paint for speakers! We went with a beautiful finish that is mostly matte with a slight shine to it. Our designers spent countless hours on the color to make sure it is not only beautiful but elegant as well to improve the appearance of your studio or room. We kept all the controls on the back of the speaker, which will keep the speaker looking very modern and elegant. The rear port is built to perfect spec to enhance the sound. The tweeter has a curved front bezel to make the highs crystal clear and distortion free. Amplifier and Speaker Components Details: To get the most efficiency we use a class “D” amplifier. We use the best quality components from the most reputable circuit manufacturers in the world in order to produce crystal clear sound. Most brands do not like to reveal what’s in the guts of the speaker. We want you to know what is inside so you realize how good of a value we are offering and also so that you can understand how good these really are. We use ADAU 1701 for audio processing and TPA3116 for amplification. These are both known to be best in class circuit designs. These components are amazing and allow us to adjust the sound via soft programing on a computer during the design stage to get the perfect sound. ADI and TI are the names of the makers of these IC’s. Most people do not know brand names that make circuits; but these are the most famous and reliable in the industry. Only very high end manufacturers like us use these components. For highs, we use a Ferro fluid enhanced 1.5 neodymium silk dome tweeters with metal grill protection. The neo magnet is strong and can handle a lot of heat. This enabled us to beef up the amplifier power without worrying about melting and blowing the tweeter. The highs on these sound really good! I cannot wait for you all to hear it in person, because I cannot describe how good these sound! You really need to listen to them in person. We use an 8 woofer. This will out-perform a regular 5 woofer any day! The bass sounds amazing on these! Very clear and punchy! The woofer has an injection molded polypropylene cone. This is an engineered type of plastic that is used on many speakers today. It is strong and puts out a great sound. The rubber woofer surrounds increase sound quality and eliminate unwanted distortions. They sound better than foam surrounds in my opinion, which is why we went with rubber. The computer optimized electronic crossover network supplies amazing sounding highs, lows, and mids. Basically it filters out unwanted frequencies from each component so that each speaker plays the right frequencies so that the speaker can go loud without distorting. We use very high-grade crossover filters in our speakers. The specially wounded voice coils produce accurate response along the entire frequency spectrum. We developed the speakers with the most optimized magnet structure, cone, and cabinet space with the goal of reproducing the sound to play back exactly the way it was recorded! Added benefits: The rear-firing port is shaped and designed by sound engineers to reduce port turbulence and deliver distortion free top sound quality! Our factory uses the latest Precision Glue Machine (Over 500 meter Tunnel Oven). Well, actually, the glue on speakers is of the upmost importance. If the glue does not hold up, the speaker will be done and blow. We use the latest machinery to manufacture these speakers. The SPL of the speaker goes up when you use better glue and a better machine that can secure the glue in place. If the glue can handle more heat than your speaker can handle more power! Thick “Wadding” protects the inside of the speaker cabinet. This can be seen if the speaker cabinet is removed. Basically, wadding is a white chemical silk type of material that we put inside the speaker cabinet for multiple reasons. It helps to make the sound more clear, and at the same time protects all the parts inside the speaker. This material is also a fire retardant. This is unique to our speakers. Most other brands do not take this step due to the cost of the material, but it is a game changer if you are trying to create the best speaker! Inputs and Outputs and Rear Panel Controls: As I mentioned earlier, we kept all the controls on the rear of the unit to make the speaker look clean and modern. The volume control, bass, and treble controls are all found on the rear of the unit. These Monitors have all your standard studio inputs and outputs such as a ¼ and XLR combo input jack, RCA input, 3.5MM headphone output. We also added a USB port. The reason we did this is because instead of having to use the 3.5MM or 1/4 TRS jack, you can now directly select the speakers as an output on your computer without using an interface! And you will get true stereo sound! 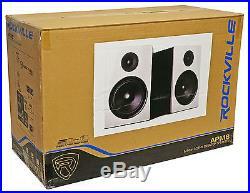 Rockville APM8 8 2-Way 500 Watt Active USB Studio Monitor Speakers in White (Pair). Two-Way Active Studio Monitor Speaker System. Quad Amp Design: Each Driver Features Frequency Specific Independent Amplifiers. Enclosure is made of top quality MDF wood. Our enclosure is not particle board, it is true high-grade MDF! The enclosure is 0.5″ thick while the front board of it is a full 1″ thickness to give you the ultimate best sound quality! Comes in 3 enclosure finish options Wood finish painted black. Wood finish painted white. Wood finish with vinyl front board. We use “baking paint” made for wood surface. It lasts long and is the best paint for speakers! Beautiful finish is matte with a slight shine to it. Our designers spent a lot of time on the color to make it beautiful and elegant looking to improve the appearance of your studio or room. The port is built to the perfect spec to enhance the sound. Full Range Class “D” Amplifier Circuitry with Auto-Switching Power Supply. LED Power on Indicator on Rear Panel. Ferro Fluid Enhanced 1.5 Neodymium Silk Dome Tweeter With Metal Grill Protection. Tweeter has 1 voice coil diameter. Curved Front Bezel Design Eliminates Standing Wave Distortion. Injection Molded Polypropylene Cone Woofer. Rubber woofer surrounds increases sound quality and eliminates unwanted distortions. Computer Optimized Electronic Crossover Network Supplies Amazing Sounding. Highs, Lows, and Mids. Rear-Firing Port Shaped and Designed by Sound Engineers to Reduce Port. Turbulence and Deliver Distortion Free Top Sound Quality! We developed the Most Optimized Magnet structure, Cone, and Cabinet Space that Reproduces the Sound to Play Back Exactly the Way it was Recorded! Specially Wound Voice Coils Produce Accurate Response along Entire Frequency Spectrum. Distortion-Free Playback Even at Max Volume Listening! To put it in simple to understand terms; the glue on speakers is of the upmost importance. If the glue does not hold up, the speaker is done. The SPL of the speaker goes up when you use better glue and a better machine the secure the glue in place Thick “Wadding” protects inside the speaker cabinet – Wadding is a white chemical silk type of material that we put inside the speaker cabinet for multiple reasons. It helps to make the sound come out more clear, and it also protects all the parts inside the speaker. Most other brands do not take this step due to the cost of the material, but it is a game changer! World class top of the line audiophile grade components! These components also are amazing and allow us to adjust the sound via soft programing on a computer during the design stage to get the perfect sound. Most people do not know brands who make circuits, but these are famous in that industry and known to be the best of the best. Only very high end products use these components. 110 Volt compatible with SMPS technology. Every Speaker in Production Undergoes a Computer Generated Sound Check Test to Ensure it Upholds to our Specifications and Standards. We use a “6Sigma” style Quality Assurance of Each Product Long story short, each product will work perfectly as advertised for a long long time! Transducer Production Line to Make the SPL Performance Stable One Complete Pair with Mater / Salve Output Connection with Included Noise Rejection Cabling. Includes a noise rejection cable to connect the 2 speakers together (This is a proprietary cable we use that connects the 2 speakers together without any unwanted noise). We also use a special cable tip that will not allow the user to plug the cable in backwards. The cable locks in secure and tight. Comes in 3 beautiful finishes: Painted Black, Painted White, Vinyl Wood Finish. Inputs / Outputs / Controls. Bass/Treble Control -4dB to 4dB (allows you to adjust high and low frequency independently). ¼ and XLR combo input jack. High Speed USB jack. 3.5mm Headphone output. Certification: CE and RoHS Compliant. Amplifier: Class D, very efficient amplifier with top components! System Impedance: Tweeter 6? Signal to noise ratio: 91dB (Maximum output with THD+1<1%, A-weight). THD: 0.10% Frequency Response: 30Hz - 20 kHz. 500 Watts peak output per pair. 250 Watt RMS output per pair. Each speaker produces 125 watts peak and 250 watts RMS. Components: 1" neodymium silk dome tweeter and 8" woofer with rubber surrounds and polypropylene cone. Product Dimensions in Inches (Single): (WHD): 9.9'' x 15.4'' x 12.2'. Net Weight(Pair): 33 LBS. Includes speaker linking cable and power plug. Input Impedance (Ohms): 10 K Ohm Balanced. System Volume: (-30dB to +6dB). About Rockville Quality Control Procedures. The Rockville brand stands for Quality, Innovation and Value. All Rockville products go through the most rigorous quality control standards in the industry. Products go through months of extensive testing before they reach your hands. All user functions are tested and all internal components are tested for quality. Rockville makes products that are virtually un-breakable! Rockville is one of the only brands in its class to test every concept model for weeks or months before starting production. Once production begins, Rockville sends product engineers to their factory to quality control every line of production. During production every product is tested and on top of that Rockville goes the extra mile and has their high level product engineers do an additional quality control. They test a certain percentage of all products from the production line a second time to ensure that the quality meets their vigorous standards, and to make sure that there is never a batch of products with even a slight problem. If your item is defective within the first 30 days of when it was delivered to you; you have the following options. We will send you a. To replace the item for a brand new one. If you want to return your item within the first 30 days of when it was delivered to you; you have the following options. This includes blown speakers with burned voice coils. Process for returning items. 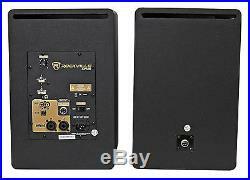 The item "Rockville APM8W 8 2-Way 500W Active/Powered USB Studio Monitor Speakers Pair" is in sale since Thursday, March 10, 2016. This item is in the category "Musical Instruments & Gear\Pro Audio Equipment\Speakers & Monitors". The seller is "audiosavings" and is located in Inwood, New York. This item can be shipped to United States, Canada, United Kingdom, China, Mexico, Germany, Japan, Brazil, France, Australia, Russian federation, Denmark, Romania, Slovakia, Bulgaria, Czech republic, Finland, Hungary, Latvia, Lithuania, Malta, Estonia, Greece, Portugal, Cyprus, Slovenia, Sweden, South Korea, Indonesia, Taiwan, South africa, Thailand, Belgium, Hong Kong, Ireland, Netherlands, Poland, Spain, Italy, Austria, Israel, New Zealand, Philippines, Singapore, Switzerland, Norway, Saudi arabia, Ukraine, United arab emirates, Qatar, Kuwait, Bahrain, Croatia, Malaysia, Chile, Colombia, Costa rica, Dominican republic, Panama, Trinidad and tobago, Guatemala, El salvador, Honduras, Jamaica.